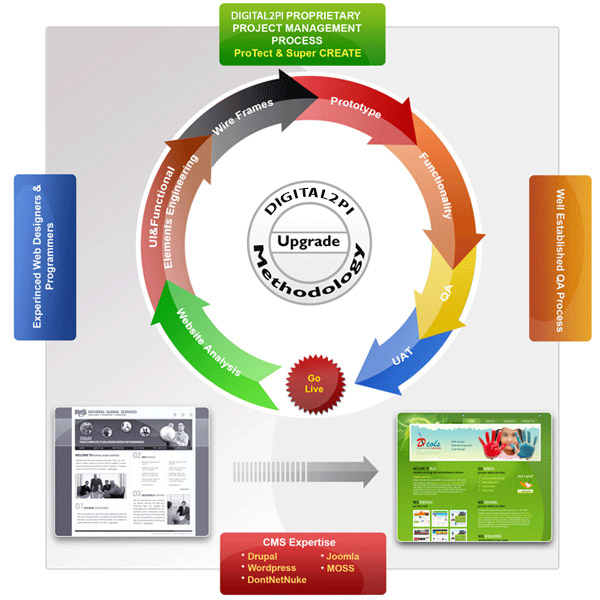 Digital2pi has been creating websites since its inception in the year 2000 and we have only got better over that time. Our typical process focuses on understanding what we want to do before starting a project and staying focused and clear whilst working quickly towards a great solution. Know your goal – When you visualize what you want, you will easily be able to know the steps to take to reach that point. At Digital2pi, try to visualize your goals and be on the same page as you are. 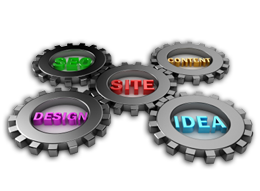 Objective of the website – Understand what the website needs to do and what its goals are. Be really clear on what is to be achieved. We communicate with you and keep you in the loop throughout the process. Knowing what you're users want – Digital2pi tries to visualize the different types of users who will be visiting your website who may be visiting from various reasons. We define these users typical goal and build you site accordingly, so that they can find what they came to the site for. Style of the website – Whilst working towards user goals and behaviour, it is important to remember that your website has to address its own goals and develop its own brand. Digital2pi balances these aspects to come up with a website to give you a website that you wanted and also a website that will promote visitor attraction. Sketch and Site map – Based on our understanding, we come up with a sketch called a paper wireframe. Here we discuss and see if the visitor can find something they are interested in. From here we move to the site map to plan out what pages will be there on your site and how they could be grouped. This ensure the users will move freely on the website. Movement - animation or dynamic lines. Lots of white spaces around important areas which are easier to identify. High-value positions- towards the top-left and down the middle depending on the layout. Making the visual elements work together - The work done in the above steps helps us swiftly complete a design that's fit-for-purpose, without getting diverted by trying lots of different page layouts which is time-consuming. Web-Reengineering is essential for organizations to effectively refocus their online presence. Website re-engineering can help you reap all these benefits with a more appealing and usable website, optimized to for more visitors. A business analyst is assigned by Digital2pi to do a full functional analysis to understand the requirements of the client website beyond the basic scope document. A thorough study of the requirements reveals any gaps and effective enhancements.Analyze business services and their relations. Identifying suitable components for the website eg Blogs, News, Photos and videos, Search, RSS, etc. At the end of this phase a functional document consisting of all the requirements is provided to client for approval and sign off. Based on the requirement analysis and specific inputs on the site layout and look and feel, our designer produce what is called a "Paper Wireframe" – a set of drawings setting out conceptually what the website would look like and how it might function. The final Paper wireframe is used to start building a prototype website with menu navigation, links, content and style. The prototype is validated in an iterative fashion with the client until it is approved. Only when the prototype is approved is a full working website produced with appropriate style sheets and user interactions. From the start the most appropriate and scaleable CMS is chosen. Coding of the CMS starts with a base set of templates. The underlying infrastructure is set up. Once the basics have been decided then the team starts customization, configuring and any new add-on features which have been identified. The site design and style is imposed on the CMS graphic templates and modular sections for easy content editing. Digital2pi's expert QA team tests the website and its functionality based on the initial full specification. Checklists are prepared for each and every deliverable and ensure that it goes through the defined process. Every release to the Digital2pi is internally signed off first by the team lead, project manager, quality manager, and the delivery manger before it is released. The proposed software is divided into number of builds, unit tested by the development team. All unit tested builds are given to independent quality test team who will test the builds in a separate test environment. Integration and system testing is performed in a separate test environment and once quality test team approves that the software meets client expectation and Digital2pi's standards, the same will be moved to the client server for User Acceptance Testing. Cross browser testing is done post the development phase. The tested application will be given to Digital2pi and the client for UAT. Any bugs reported during this time are quickly fixed and re-tested. Once satisfied all the features and functionality work as per the specification, the delivered application is then signed off. Digital2pi will provide free extended support during the 30-day warranty period to make sure that any unforeseen bugs reported are resolved without any additional cost to the client.